This is an excerpt of a course I put together for MarketingProfs called the Marketing Writing Bootcamp. It's a 13-part series that includes courses from amazing writers like Joanna Wiebe and Arienne Holland Overman. You can use the code BOOTCAMPDALY to get $200 off the series. Learn more here. It's really hard to edit your own writing. Wired reporter Nick Stockton explains that revising your own work is difficult "because what we see on the screen is competing with the version that exists in our heads." This is why most people advise walking away from your draft for a few days. The less familiar it feels, the easier it is to edit. Still, the ability to edit your own work for style, tone, structure and substance is valuable—and it's not impossible. It's unlikely your self-imposed edits will ever be as good as the suggestions of a skilled editor, but getting comfortable with a few strategies for revising your own work will make you a better writer. Here's a process that I use for myself and the writers I work with. I hope you find it helpful and please don't hesitate to reach out with suggestions on Twitter. What is the difference between good writing and bad writing? The answer is almost always that good writing is the result of many revisions and ruthless editing. The biggest reason that articles—and specifically content marketing—aren't good is because the writer passes off their first draft as a final product. First drafts are supposed to be bad. A first draft is an export of information from your brain to the page. First drafts are writer-centric. As you write, you realize what you are trying to say. It requires a certain amount of "throat clearing" to write effectively. This is why you can cut the first few hundred words of almost any first draft and end up with a better article. 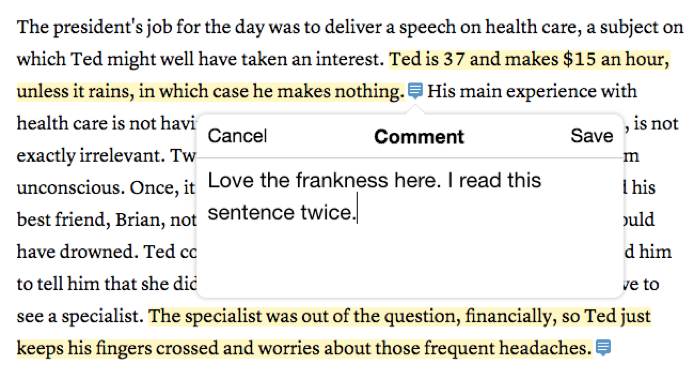 As you edit, writing should become more reader-centric. Ideas end up where they belong, words are cut and arguments are made. What that in mind, there are a few ways to identify the writer-centric and reader-centric elements of your own work. To get better at writing, you need to understand—in very specific terms—the difference between good and bad. This is called taste and it's a skill that can be developed. In a post on Signal v. Noise, David Heinemeier Hansson says that "the best way to learn what details that matter is to examine the details of great and not-so-great work and contrast and compare." You probably have some abstract ideas of what makes writing great. Codifying those ideas leads to refined taste and better writing. Start by finding a few articles you love. Avoid content marketing at all costs—look instead to newspapers and magazines. If you're stuck, check out the Pulitzer archives for tons of great examples. Save an article to Instapaper and use their commenting feature to mark it up. The snippet above is from Gene Weingarten's excellent article None of the Above. Try to reverse-engineer what you like about the writing. Leave specific comments. Don't write like a wine critic—just record the reaction you have to the words. You'll be able to observe things that great writers do that you can mirror in your own work. Perspective from an editor or reader will also help you identify places where your writing needs improvement. I highly recommend paying a good editor to workshop your writing. Any writers feel like reading a draft of an upcoming post? You can also take advantage of social media to connect with others writers. The /r/writing subreddit conducts weekly critique sections. People on Twitter are often willing to help out. Join Facebook and LinkedIn groups for writers. A little bit of networking goes a long way. Some habits are personal, some are widespread. Here are a few I see over and over again that are easy to fix once you can identify them. It takes a while to get warmed up when you sit down to write, so you should always plan to trim your intros. This is the often the easiest place to cut words. In the example below, the "second draft" is the actual intro of Paul Graham's Maker's Schedule, Manager's Schedule. The "first draft" is how I imagine his first draft may have looked (and it's the type of intro I see way too often in published work). Did you read the two closely? Notice that they say the exact same thing. Dependent clauses are easy to write and hard to read. Absorb this idea and you'll start to notice them everywhere. Dependent clauses require more words and more punctuation. Don't worry about this in first drafts, but be prepared to clean them up in second drafts. The issue is that the most useful content gets buried in the article. Write your first draft in the order that you experience the subject, then reverse-engineer that experience to present the most useful ideas first. Bad habits can be broken. Once you've gotten good at identifying them, you can use some of the following tactics to break them. Humans need rules. Rules are anchors. Instead of staring at a first draft with no idea where to start editing, apply rules. This keeps you focused on a specific outcome and it's the best way to break bad habits. It's commonly believed that operating within constraints stimulates creativity and forces us to examine problems from different angles. One of my favorite writers, James Clear, says that "Limitations drive you to figure out solutions." Keeping a few rules in your writing playbook makes editing a far less stressful task. To get from the first draft to the second, cut 25% of the words. To get from the second draft to the third, cut another 25%. Now you’re sitting pretty at 843 words. Fewer words is almost always a good thing. Giving yourself a goal word count for each revision forces you to consider what you need to keep versus what isn’t really necessary. This also helps you let go of parts of the article that you like, but aren’t important to the reader. Too much punctuation often results in bad sentences. There is nothing inherently wrong with commas, but they often enable bad writing. If you have a sentence with more than one comma, split into two sentences. Commas are an indicator of sentences that begin with dependent clauses (like the one above!). Rewrite those sentences with no commas. Remove semicolons unless you’re a grammar pro. Make up a rule to help you break bad habits. You can make up all kinds of weird rules that seem useless but actually improve your writing. If, for example, you find a lot of dependent clauses in your writing, edit an article to remove every dependent clause. Don’t start any two sentences with the same word. Turn your article into a tweetstorm. I know these seem arbitrary. The point is simply to create a constraint to work within. Your writing will improve (almost) regardless of the rule because you'll be forced to think outside of your normal writing patterns. It takes years of practice to become a better writer. The best writers know that their best work isn't just written, it's rewritten over and over again. Keep going. Keep writing. Keep editing. The ones who stay the course are the ones who will experience the satisfaction of publishing work they are truly proud of.